Some of Lumosity’s new conference rooms have views of the San Francisco harbor. There’s some fun built in, too: Each room is named after a Lumosity game. 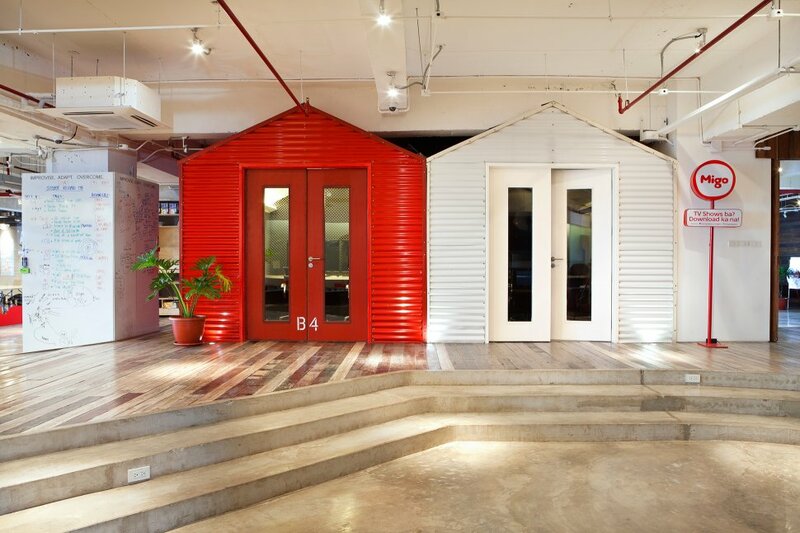 While this company is all business, the office has a lighthearted vibe. 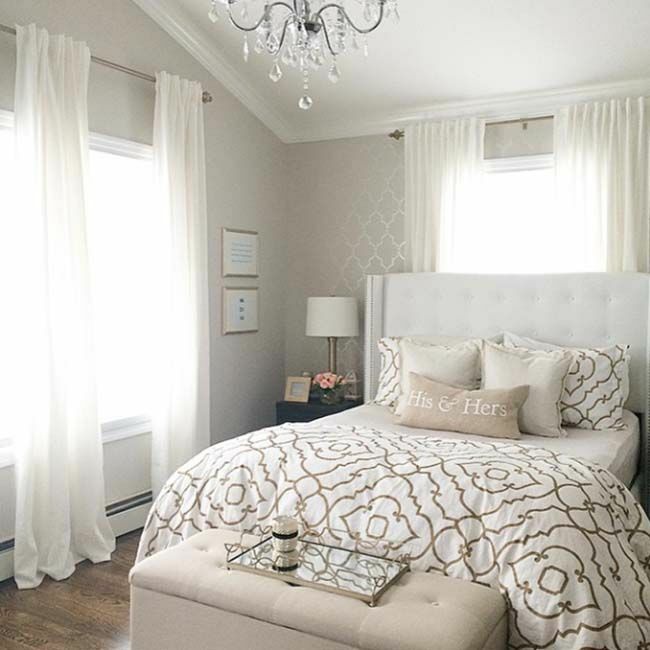 This roughly 2,300-square-foot space is largely made from galvanized metal, a material commonly found along streets and lanes in its home of the Philippines. The amphitheater, featured above, is a space for group conversations. The design hints at CEO Barrett Comiskey’s vision to take “Migo on a journey around the world bringing entertainment and education to everyone. 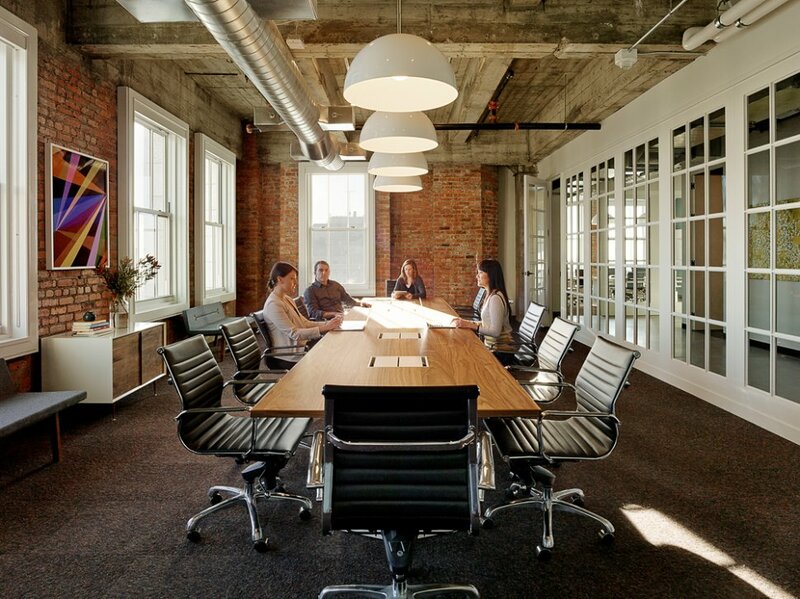 Creating an office space that’s unique, breathtaking, and functional is no easy task. These seven companies–and the design firms that worked with many of them–go above and beyond. Or, rather, they go over, under, and through, with the most impressive office-design details our judges have ever seen. “The Davenport,” one of Fueled Collective’s nine conference rooms, can be accessed via this hidden entryway, through the door of a wardrobe. Here, CEO Rameet Chawla stoops to enter the room. Inside, the Davenport has an equestrian theme, sparsely decorated with framed images of horses. There are videoconference centers masquerading as old-timey cottages, ladders to elevated nap pods, and secret doors tucked into paintings and bookshelves. These awe-inspiring modern offices are located across the globe, from San Francisco to Manila, and they come in a diversity of sizes, styles, and design aesthetics, to fit a diversity of businesses. Migo’s videoconference centers, pictured above, are a spirited imitation of many makeshift homes in the Philippines. The designers built them mostly from recycled material, such as wood planks and windows from the Filipino province of Capiz, which were obtained at “junkyard prices. Designed with the goal of making Fueled Collective a more positive workplace, this 18,000-square-foot office is located in New York City’s SoHo neighborhood, but it packs a Portland-esque punch, complete with vintage-feeling leather couches, lounge chairs, and even (you guessed it) an office dog, whose name is Greta. 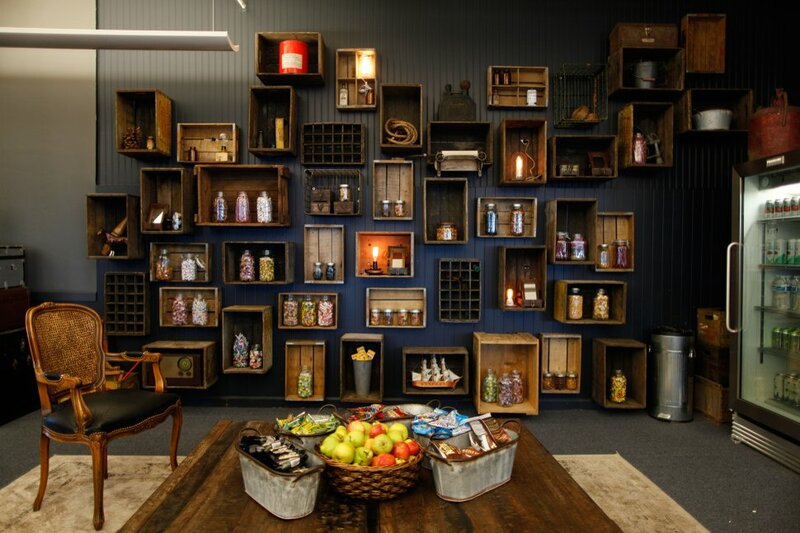 The snack wall, pictured above, becomes a three-dimensional experience: Candy and other snacks (atomic fireballs, Mary Jane chews, and other throwbacks) are stored in multisized Mason jars, jutting out from the wall in wooden crates. With one of the most elaborate office spaces in New York City, Fueled Collective hosts more than 30 startups in SoHo’s Prince Building. 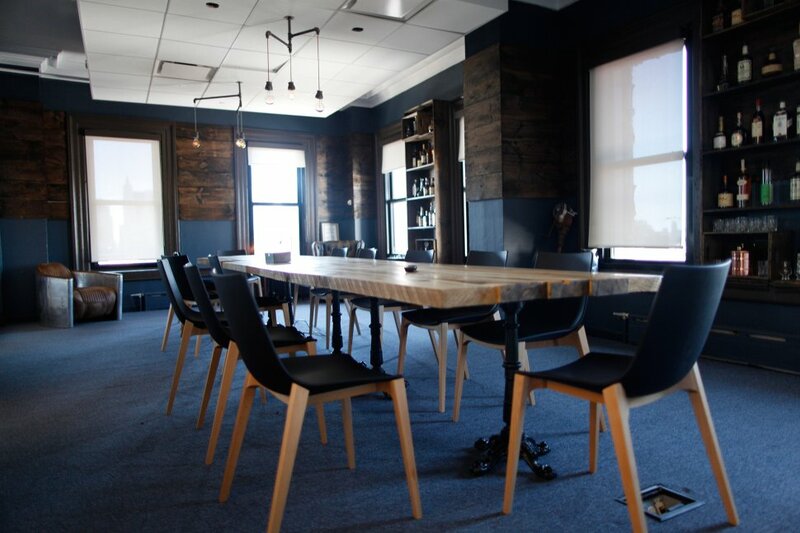 In addition to offering year-round ice cream and popcorn in the office, this conference room is also stocked with whiskey, bourbon, and other (artisanal, we’re sure) liquors. 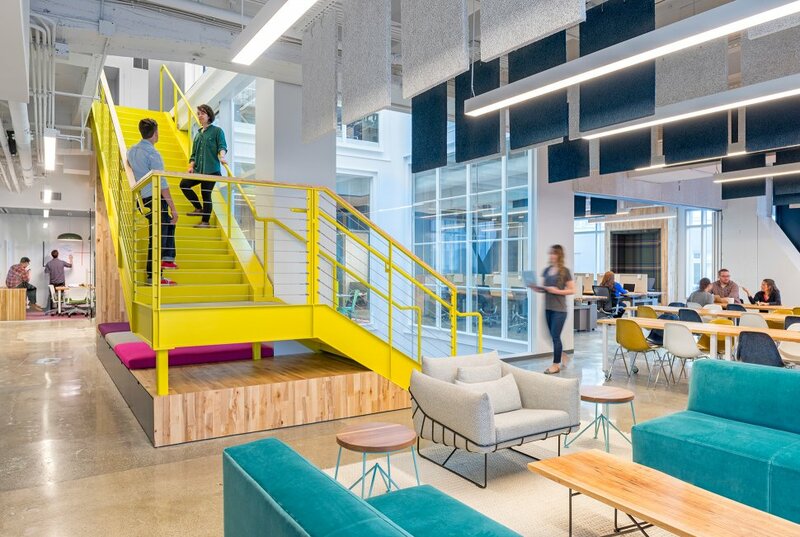 This playful, studiolike space includes elevated sleeping nooks, connected to the ground by way of treehouse style ladders, and “gabled blue” support beams cut across the communal workplace. These beams represent a modern architectural trend–making the space feel larger than it actually is–and also contrast with the building’s other features. Just out of sight are such neat details as an elevated bike rack and visually-pleasing-but-sound-absorbing panels that dangle from the ceiling. 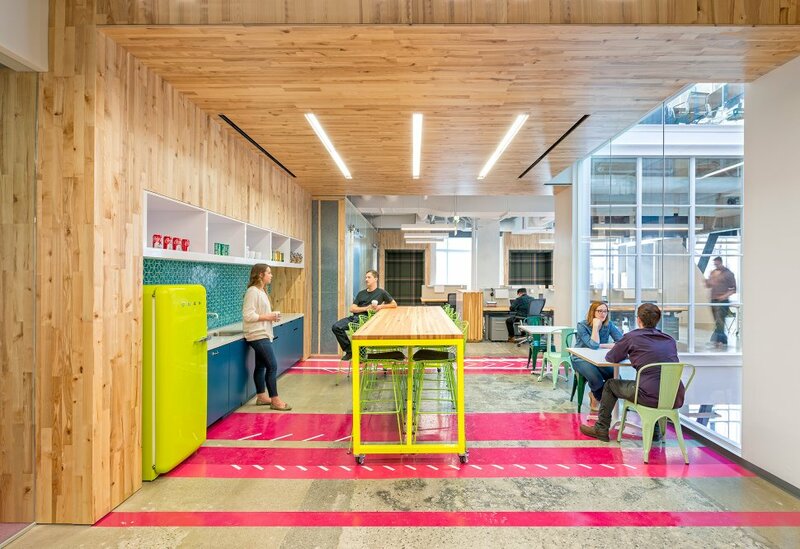 The whimsy of this creative office extends into the communal kitchen, where a neon chartreuse refrigerator meets vibrant pink flooring and a sleek, wooden roof. 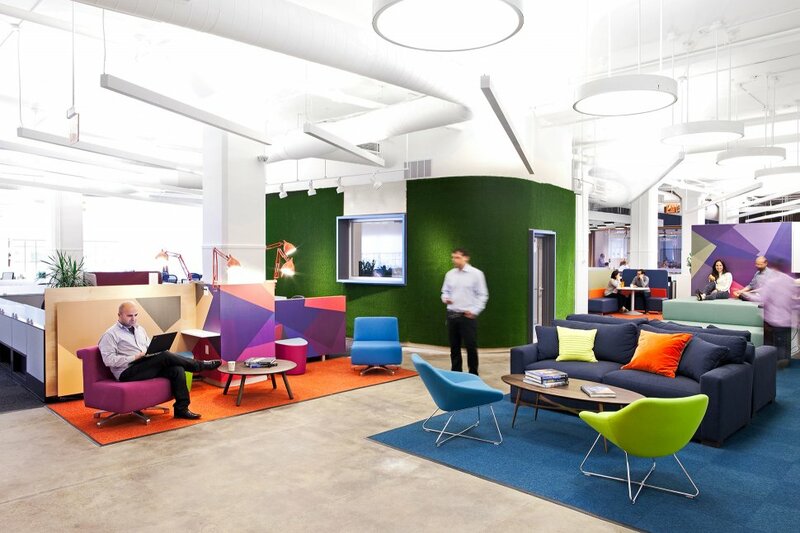 Capital One Labs emphasized to Studio O+A that it wanted its “wide open spirit” to be reflected in the common areas. Here, glass walls make the kitchen visually continuous with the rest of the office. Lumosity boasts a secret library for its employees, which is separated from the public lunchroom by a bookcase door. “You go there to focus,” says Fucinaro. Complete with antique books, leather couches, and blue tile flooring, the room adheres to an overall rustic color scheme. Perched in one corner of the open office is a multicolored hammock, which reflects LivePerson’s fun and friendly company culture. Sunscreen, anyone? LivePerson’s new third-floor expansion is splashed with color, a nod to what designer Mapos calls the company’s “culture of spontaneity and collaboration.” It includes no private rooms, and the central area contains tables on wheels that can be folded and re-assembled in order to accommodate different types of work (seminars, conference calls, individual focus, etc. ). The so-called breakout space, pictured above, is scattered with plush chairs and couches, for both meetings and quick breaks. 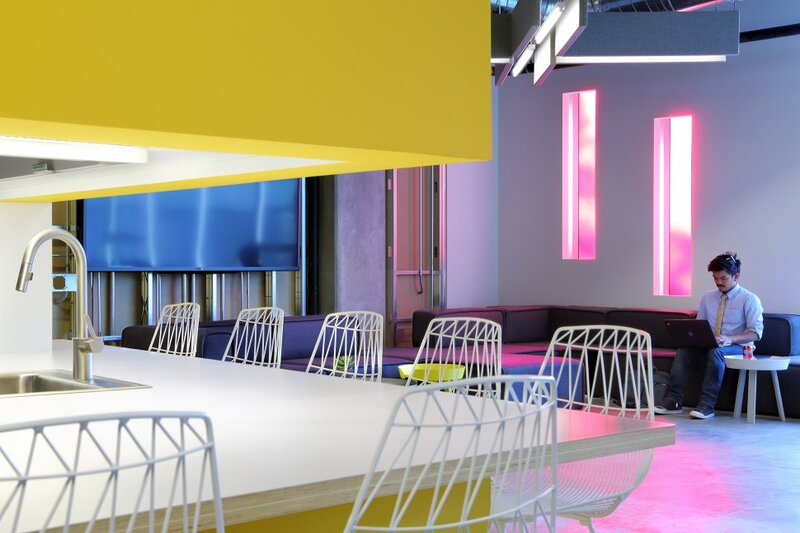 Funny or Die’s new office spans more than 7,500 square feet over two separate floors, all decked with its now-signature neon-colored walls and stairs. 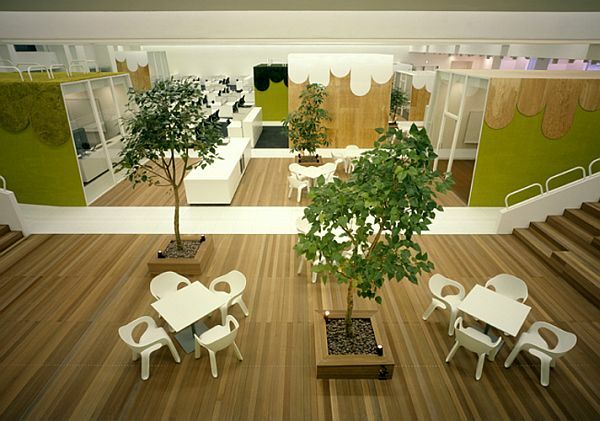 The modern office doubles as a film studio and production center, which necessitates a flexible interior design. And it is color-coded: Blue areas are more focus-oriented, while yellow areas are for socializing and group work. 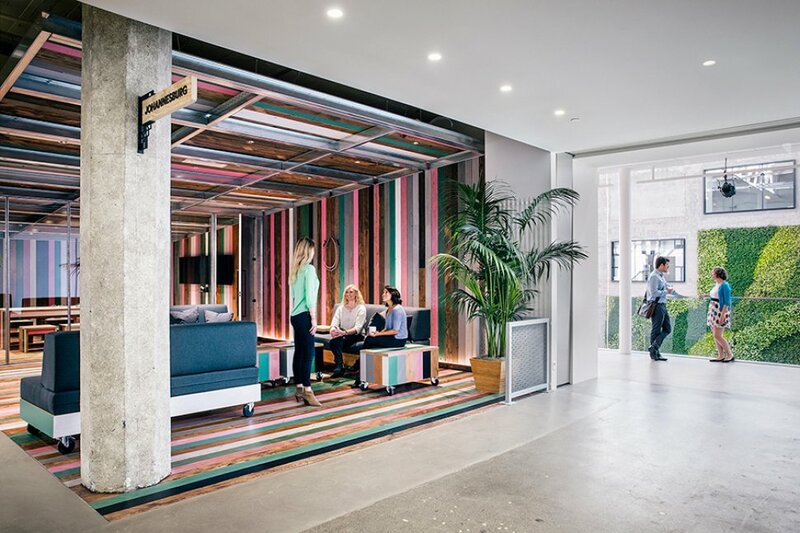 Nestled in an old industrial building, the office captures “the spirit of L.A. and its scrappiness,” according to lead designer Amelia Wong. 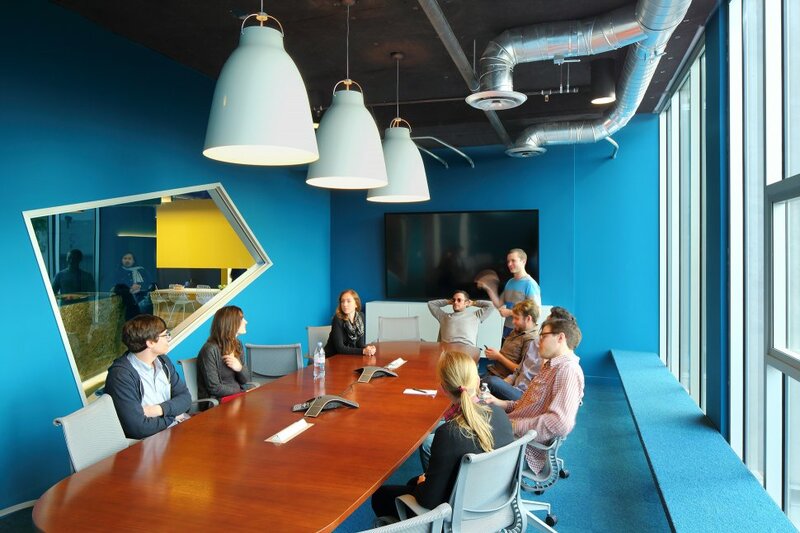 Funny or Die’s conference rooms have a uniquely Southern California feel, with massive light fixtures and peacock-blue walls that speak to the company’s vibrant personality. The oddly shaped interior window is designed as a sort of “peep hole,” says Wong, giving employees a hint of privacy within the generally open workspace: “We like to create moments for serendipitous encounters,” she explains. 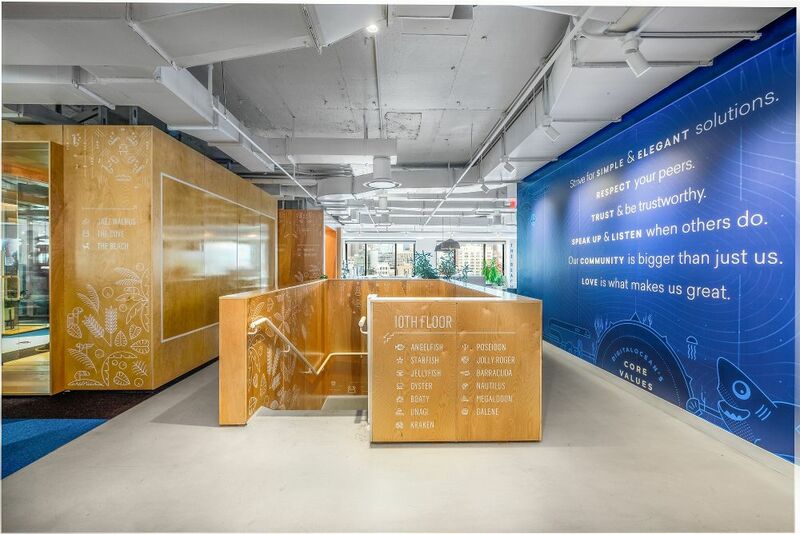 Lumosity’s office encompasses 36,000 square feet in a recently converted Art Deco building. 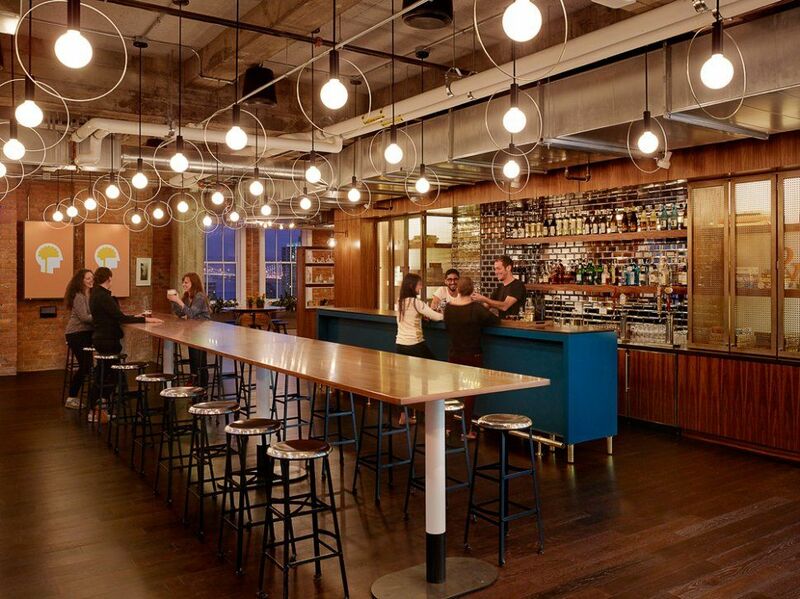 The bar area, pictured above, is a bright, open space designed to reflect the attitude of the company, which makes brain-strengthening apps. 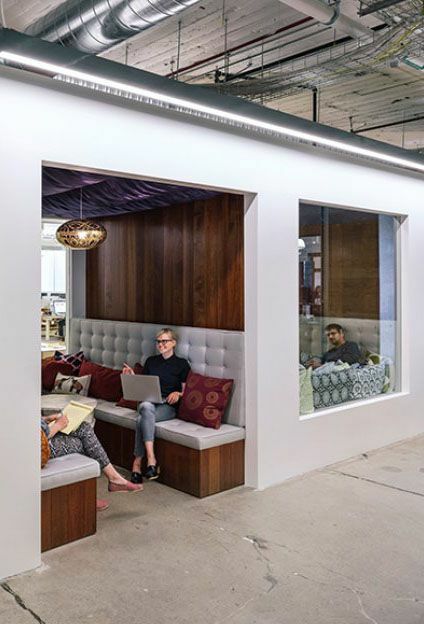 As CEO Kunal Sarkar puts it, “Employees are constantly interacting and socializing.” Designer Sarah Fucinaro says the company’s founding-team members gather here for cocktails each Friday. Sleek, dark-wood flooring and sculptural light fixtures top it off, and the kitchen beyond is perpetually stocked with kombucha and coconut water. 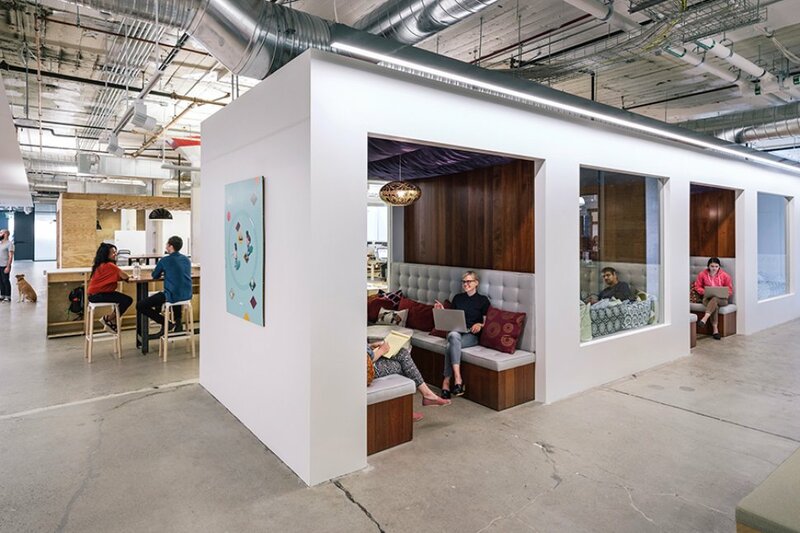 This 3,500-square-foot office for Capital One Labs–a group that designs apps for its parent bank–sure doesn’t look like the inside of your average financial institution. Instead, its wild color scheme and unusual angles nod to the innovative spirit Capital One is trying to foster in its employees. Studio O+A, the architecture firm that designed the office, describes the staircase pictured above as “rustic drama” yellow. “You’re creating an experience coming down those stairs,” says designer Alma Lopez of Studio O+A. Scroll down to see some of the world’s most brilliant office interiors. 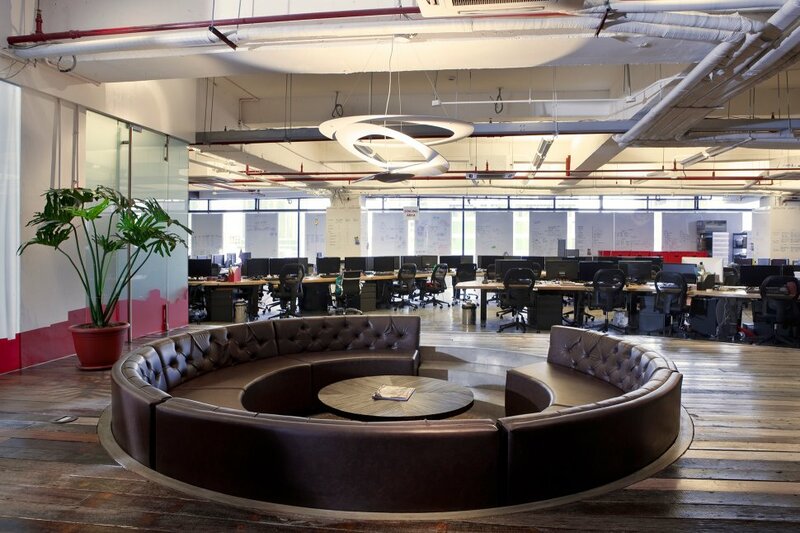 And don’t forget to let Inc. know which of these runners-up to our 2014 World’s Coolest Offices is your favorite. You can add a comment below, or simply tweet your favorite to join the conversation.